Today we are going to speak about ORSiO and Quanta companies, rather than a stand-alone communicator going by the name of ORSiO n725. The reason for that is quite simple – the model in itself is a slightly modificated O2 XDA Atom unit, that we gave an in-depth try-out a bit earlier. Repeating our own words won’t make much sense, thus we would rather like to dwell on made alterations. Thereupon the company’s prospects and place on the market are of more interest to us. HTC’s fame of the market’s leading Windows Mobile-powered devices manufacturer gives no rest to its rivals, especially to the Taiwanese OEM/ODM companies that would hardly miss the change to earn some coins on the rapidly expanding market (according to Gartner Dataquest, average annual increase in sales of Windows Mobile-based devices until 2009 will make 134%). A relatively new player to the market – Taiwanese Quanta Computer is a known ODM-manufacturer of notebooks; nevertheless apart from this business, the company has been running production of some models of handsets for Philips, Nec, Toshiba, therefore one could hardly call Quanta “a newcomer”. In case a company decided to get into development of Windows Mobile-communicators or smartphones, then the first thing to do is take care of prospective buyers, in other words players that would purchase such solutions and distribute them under their own brands. International operator O2 was Quanta’s very first client – not only did he believe in success of O2 XDA Atom, but undertook a couple of seemingly unusual steps. Namely, for promotion’s sake they established www.seemightyatom.com that is still online – its contents include information on O2-branded units manufactured by Quanta, alone. 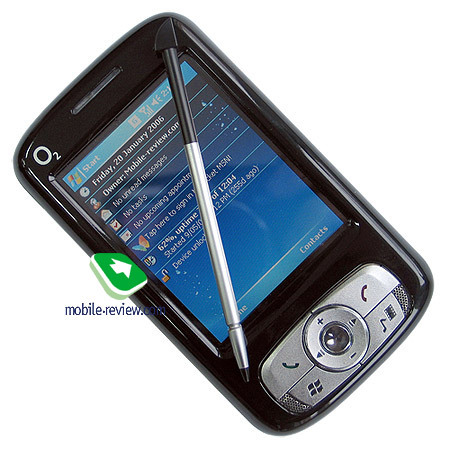 For the time being there are two models - O2 XDA Atom and its updated edition O2 XDA Atom Exec. After that the company signed another important contract with HP – that’s why HP iPaq rw6800 series came to life. These HP’s devices have been around on the Asian market for quite a while already, and by the end of this year are bound to hit the European countries. The Russian market, for example, will see the release of these models in December. With the advent of such world-wide famous brands like O2 and HP, Quanta has seemingly lost its head and rushed towards the same avalanche of mistakes made by HTC in its time. And while HTC can offer an ironclad excuse – the company was in fact the pioneer in this field – Quanta has apparently come to think of it as a natural process that cannot be avoided. The plot is quite simple – release as many identical devices under various brands as possible and the sooner the better. It is good when number of involved trade marks exceeds 20, but the best thing to happen is 30 and more. At that on every given local market, hypothetically, one will find three or four brands showing off nearly identical devices. But a few years into such philosophy, it becomes clear that something is to be changed, since it’s amazing how big the number of trade marks grows and how confused customers get. After that the company announced total re-branding and aims at gathering all offerings under a single trade mark, in order to build up a recognizable brand name. And while HTC is at the last stage of this race, Quanta is getting to the starting line. Developments of ORSiO Solutions, coming from Taiwan (though there are no reliable confirmations stating that it is Quanta’s subsidiary, but such possibility is definitely not to be left out) had the Russian market on top of their priority list – the releases in the US and Europe are still to come. 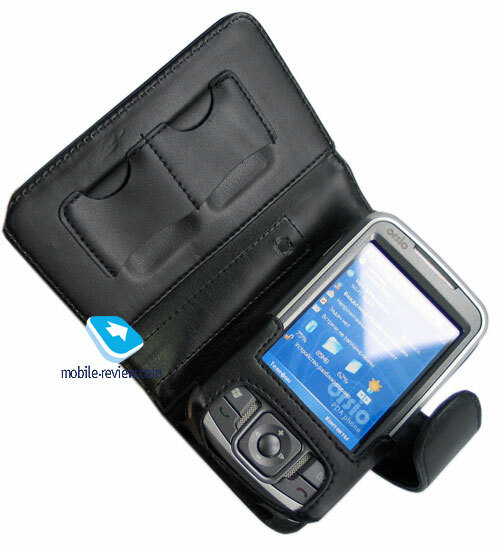 The first model, ORSiO n725, is nothing more but O2 XDA Atom Exec packed in HP iPaq rw6800’s casing, while HP iPaq – is in reality the “old” O2 XDA Atom in a different wrapping. Have you already gotten lost? More “clarity” is brought by recent announcement of a Russian “manufacturer”. Consumers in Russia have more “luck”: Quanta’s first solution will be available in December 2006 under four rather than three labels. As a matter of fact Rover G5 is stepping onto the scene, which is a replica of ORSiO n750. It’s important to realize that what we see is only the beginning – in future number of brands will get even bigger, as new operators and vendor will be joining the heap. All in all, customers’ confusion and dissolving of the trade mark will be following in the footsteps of HTC – in other words, will be gaining in complexity. 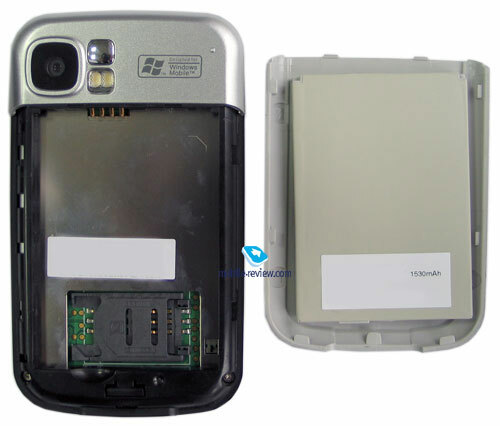 Let us look into differences between ORSiO n725/O2 XDA Atom Exec and “standard” O2 XDA Atom. Which specifications were “boosted”? Replaced memory chipset, hence file system has gotten much speedier. Volume of manageable bundled flash-memory has increased. 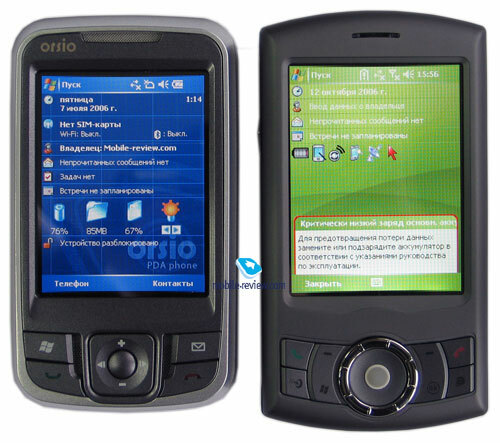 Facing off O2 XDA Atom and ORSiO n725 we cannot overlook a couple of crucial points – design, casing and performance. So, we are giving them a step-by-step close-up. 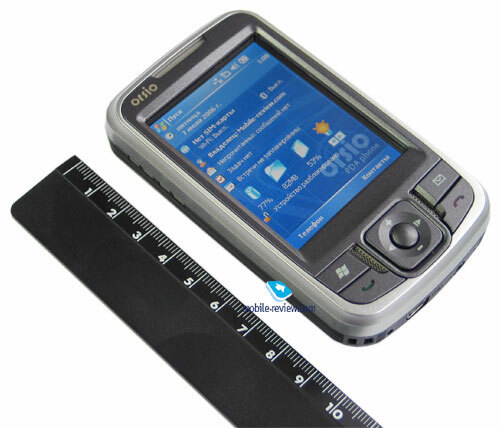 While dimensions, controls layout are pretty much the same, ORSiO’s design has a little in common with O2 XDA Atom, on the contrary, on the face of it’s an exact replica of HP iPaq серии rw6800. Casing’s trim - shades of gray. Unlike O2 XDA Atom, the plastic used is not glossy, which means it’s not a fingerprints magnet (basically it’s only of the worst things about having O2’s model). The buttons mounted on the sides are accidental press-proof – they are too tiny and sunk inwards. On one hand – an obvious advantage, but if you come to think of this, it’s not easy to press them meaningly, some practice is required. Right after the release, O2 XDA Atom it got covered with an avalanche of reproaches concerning its slowness that originated mainly from the file system’s slow downs. In its turn Quanta made numerous attempts to get the device work faster with new firmware various – the fact is, with the help of latest updates, the XDA Atom got speedier indeed. 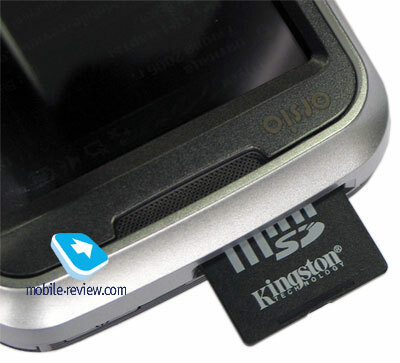 Though the pick of capacity is put up by O2 XDA Atom Exec/ORSiO n725, featuring a brand-new flash-memory chipset, therefore it’s the fastest unit available among its closest rivals. To test the device’s performance, we used SPB Benchmark kit – for reference we looked at results of similar models and PDAs manufactured by Dell. Performance-wise the CPU puts on really good numbers. This index displays how fast the device handles RAM (read/write/move) – and the figures are exceedingly remarkable, in fact they are the best among Windows Mobile 5.0-based devices. The index measures speed of bundled application – while O2 XDA Atom simply could not master this one, the ORSiO has one of the best results. Synchronization speed is on a pretty high level. The final index indicates overall system’s performance; however we are not publishing it since it has almost nothing to do with the reality, being distorted by file system indexes. 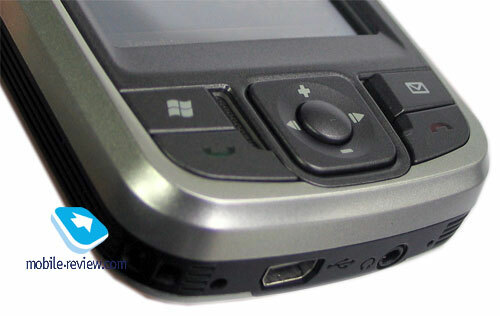 But owing to tailored handling of file system, its value reaches an incredible rating for Windows Mobile 5.0 – 962 points. 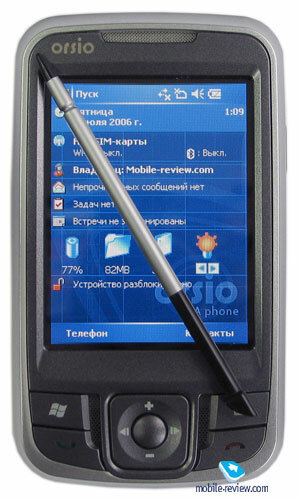 The Russian market is getting the communicator with Russian edition of Windows Mobile 5.0 onboard. Among fetching bundled third-party apps only FM-radio manager, Java-machine and a plug-in for Today screen (indicates battery status, volume of free memory and backlighting scroll bar) stand out. In the near future the communicator will come included with a CD containing SPB Pocket Plus application. Model ORSiO n725 delivers good receiving quality. Ring tones and silent alert are average strength-wise. O2 XDA Atom is Quanta Computer’s very first experience, moreover, one could hardly say that it is a spoiled one – on the contrary, having made use of HTC’s developments (as Quanta has adopted a part of HTC’s researchers), the Taiwanese manufacturer has managed to come up with a very competitive solution. The revamped edition of its first commercial offering, Quanta has managed to get rid of one of the most fundamental flaws in a convenient fashion – speed of file system management that strongly affects other applications. The updated model boasts the best file system architecture among all rivals. Unfortunately, another shortcoming concerning lifetime, has not been eliminated yet. The guideline retail price makes 790 USD for the time being, which is too much, taking account of the rivals being offered at prices at least 100 USD lower (Qtek S200, E-Ten M600+). 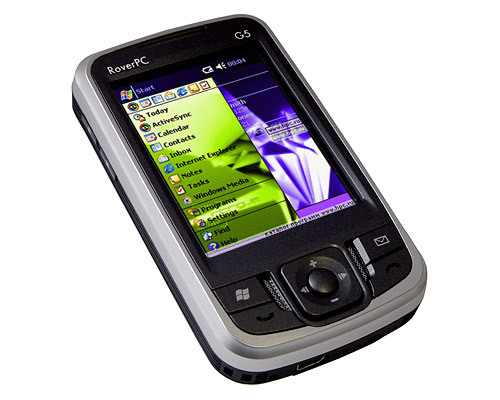 The company will definitely be forced to cut down the price, with the deadline expiring in December, when the Russian market sees releases of Rover G5, HP iPaq rw6815. In light of new HTC’s strategy, this company might start experiencing certain confrontations with some operators and vendors and there are some strong reasons to believe that some orders initially meant for HTC will be given to its competitors, and Quanta, as one of the best candidates, is among them. Today, though, we see how Quanta is following in the footsteps of HTC – the same mistakes and actions seem to never change: utmost number of identical products under different brands, least possible investments into marketing and own brand backing up the whole plan. So, what is coming up? At present the manufacturer has only one model to offer. The following proposal will be somewhat similar to HTC Wizard, incorporate sliding keyboard, Wi-Fi, Bluetooth, GPRS/EDGE and bundled GPS-receiver. Approximate release date – December 2006. Quanta has what it takes to get hold of a part of HTC’s market share in two years’ time or so. Nowadays Quanta’s list of partners features world-wide recognized names like HP and O2 what is already quite something. Possible acquisition of Quanta by Foxconn might bring about some positive thing as well – Foxconn is owing the Taiwanese CMCS, which is in charge for Motorola MPx200/220, so that the company’s line-up might come to boast a couple of smartphones as well.